DUBAI, United Arab Emirates — The first astronaut from the United Arab Emirates will blast off into space on Sept. 25 on a trip to the International Space Station, authorities announced Monday. 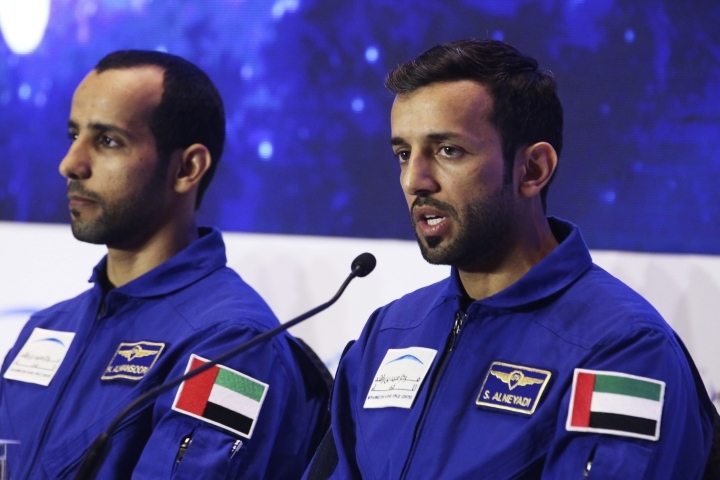 Either military pilot Hazza al-Mansoori or engineer Sultan al-Neyadi will be the first Emirati in space, part of an ambitious space program for this Gulf Arab nation home to the world's tallest building and the busiest airport for international travel. But the two men, selected from over 4,000 applicants, say they aren't worried after the recent failure of another Russian rocket carrying astronauts to the space station. "After the incident we were more confident with the preparedness of the mission," al-Mansoori told The Associated Press. "In case of any failure there is equipment onboard the rocket to ensure the safety of the crew, which made us more confident that the system works with a high level of adequacy." That incident happened Oct. 11, which saw a Soyuz-FG rocket carrying U.S. astronaut Nick Hague and Russian cosmonaut Alexei Ovchinin fail shortly after launch due to a damaged sensor. The two men landed safely in Kazakhstan. 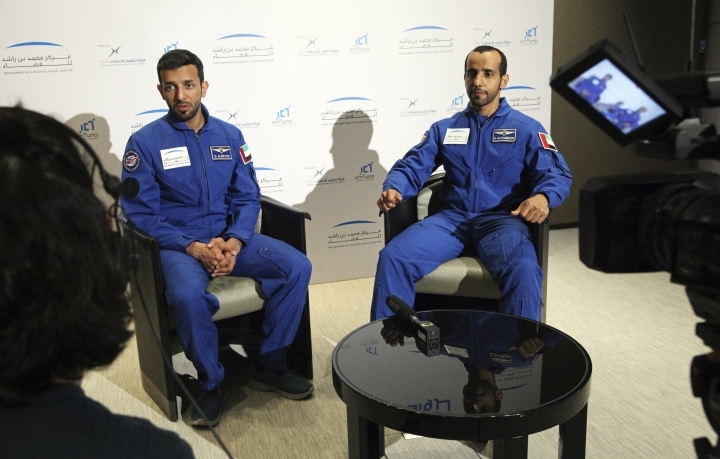 "The astronauts who were involved will go into space soon," al-Neyadi said. "This shows how safe the Soyuz is, that astronauts are able to survive in case of any accident." Both men have undergone intensive training at the Star City space center outside of Moscow, which included pressure chamber tests, centrifuge tests, parabolic flight training, and winter survival training. Parabolic flights allow astronauts to train for being weightless in space. "Since I'm a pilot, I was able to withstand a gravitational force of 9-G," al-Mansoori said. "Now I must train in this sort of gravitational force, 0-G, the lack of gravity." Al-Neyadi said the biggest challenge he faced was not a physical one. "The most difficult thing perhaps was learning Russian, since it's the only language which we will use to communicate with the crew onboard the vessel," he told the AP. "It was also the language they used while training at the center in Russia." The Russian Soyuz spacecraft is currently the only vehicle that can ferry crews to the International Space Station after the U.S. space shuttle fleet retired. Organizers had said they'd announce the name of the astronaut going Monday. They didn't, without offering an explanation. It remains unclear when authorities will choose the first astronaut to go in September. The first astronaut will travel in September with the Russian space mission aboard Soyuz MS-15 and spend eight days at the International Space Station. The selected astronaut will return onboard the Soyuz MS-12 and then be replaced by the second astronaut. The UAE has a fledgling space program with big ambitions. It launched its first locally made satellite, KhalifaSat, in October from Japan. It also wants to launch a probe to Mars in 2020. The UAE also says it wants to colonize Mars by 2117, with a fully functioning city of 600,000. 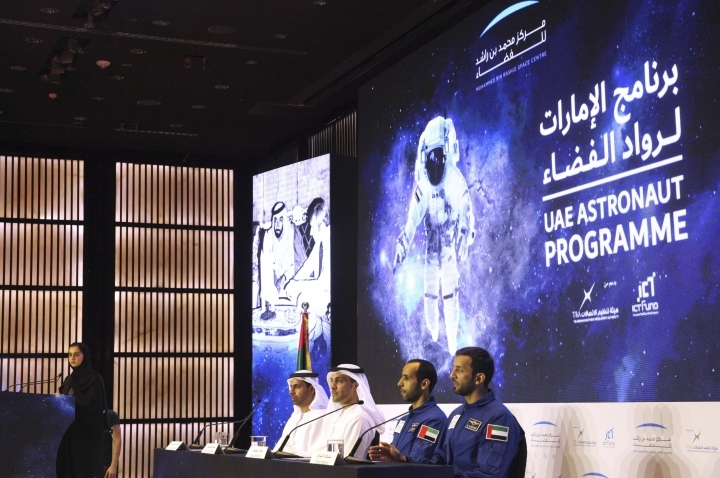 Though the men will be over 400 kilometers (250 miles) above the Earth's surface while on their trip, the Emirati astronauts will have a taste of home when they travel closer to the stars. Russia's state-owned RIA Novosti news agency quoted an unnamed industry source saying that UAE space travelers have been offered a menu of Arab dishes to select from when they go into space. The men have chosen maqloubeh, a one-pot rice dish, salona, a lamb stew, and the standard hummus, the agency reported. Follow Malak Harb on Twitter at www.twitter.com/malakharb .